Expecting the state to truly reform the nation's engines of financialization is like asking the cocaine addict married to the wealthy dealer to divorce the dealer. Most observers think they know why the government (i.e. the state) has failed to truly reform the financial system: corrupt politicos on the receiving end of the Too Big to Fail (TBTF) banks and financiers' millions of dollars in lobbying and campaign contributions do the banks' bidding. While the reduction of democracy to an auction in which the highest bidder controls the state is certainly one systemic reason for this abject failure,there is an even greater, more deeply systemic reason why the state cannot reform the rotten core of financialization. The state has become dependent on the wages and profits of finance for its own revenues. Here's an analogy of what's happened in the past few decades of financialization: you meet Mr./Ms. Right (he/she is attractive, makes a lot of money, well-dressed, good social skills, etc. ), fall in love and marry. Unbeknownst to you, Mr./Ms. Right is a cocaine dealer. When you find out the source of the fat paychecks, he/she reassures you it's just business and that he/she never uses the stuff. But if you want to try a taste, go ahead--it won't hurt you. You think about leaving him/her, but the money is just so good. Life without all that easy money looks bleak and difficult. Just to see what all the fuss is about, you try the cocaine. So now you're addicted not just to the easy money but to the cocaine, too. Now it's impossible to leave the dealer. Substitute finance-dependent profits and wages for cocaine and you now understand the marriage of the state and the engine of financialization: financialization has generated the big profits, the hefty wages that pay most of the state's income taxes and enabled most of the consumption of the past three decades. Were the state to actually limit financialization--excessive debt, leverage and risk-- it would be cutting the primary source of its own revenues. The wages and profits generated by financialization aren't limited to banks and financial institutions--every industry that depends on leveraged debt and cheap credit is ultimately an arm of financialization. This includes the entire FIRE economy--finance, insurance and real estate--as well as the auto industry, home furnishings, boating, recreation, tourism--every industry that has been living off credit cards, home equity lines of credit (HELOCs) and other sources of cheap credit. Cheap credit is the cocaine, and not only is the state addicted to the cocaine of cheap credit that enables its own stupendous borrowing, it's also addicted to the easy money that is generated by our economy's addiction to credit. 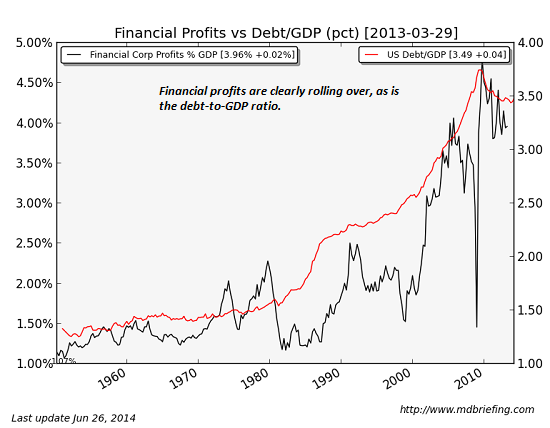 Take a look at this chart of financial sector profits. Recall that all corporate profits are about 11% of gross domestic product (GDP). So purely financial profits are about one-third of all corporate profits--an extraordinarily high percentage historically. But this chart vastly under-represents the true impact of financialization on profits and jobs. How many homes would be sold if all buyers had to put down 20% istead of 3.5% for FHA loans? How many vehicles would be sold if buyers had to put down 20% of the vehicle's cost in cash and qualify for a 3-year loan? How much of the economy's consumption would go away if credit cards had to paid in full every month? How much federal income tax does a minimum-wage retail worker pay? Zero. How much income tax does a $300,000 a year finance worker pay? A lot. Truly reforming the financial sector to eliminate the cocaine of financialization would gut not just credit-based consumption but state tax revenues.